Somnath Bharti is an Indian lawyer, practicing at the Supreme Court and Delhi High Court, who took to politics by joining the Aam Aadmi Party. He was elected as the AAP candidate for the Malviya Nagar constituency in the Delhi assembly elections of 2013 and was made Minister of Law, Tourism, Administrative Reforms, Art and Culture in the AAP's Delhi governement. Bharti's wife has recently filed a domestic violence case against him as well as charged him for trying to force a miscarriage on her when she was pregnant. This has given his political opponents a lot of ammunition to fire at him. While the legal proceedings are still going on, Ganesha analyses what the future holds for him. Jupiter will be aspecting his Natal Jupiter till 11th August, 2016. It will also be aspecting his Natal Sun in his Solar Chart. Ketu will be transiting over his Natal Venus till January, 2016. After this, it will be transiting over his Natal Jupiter. Saturn will be transiting over his Natal Rahu. It will be aspecting his Natal Mercury and Ketu during the entire year ahead. Considering the transiting planets mentioned above, Ganesha feels that Somnath Bharti will be able to somehow save himself from the current tricky situation. It seems that his political career may not get affected much due to the legal proceedings initiated by his wife. However, these charges could give his opponents some ammunition to attack him with, but they will not be able to defame him. Bharti may face more legal problems and troubles from the police and his wife till January, 2016. Is he in for more trouble or do the planets indicate some respite? The current transits shall support him to some extent. Which means, though he may face some problems in the immediate future, he will be able to come out of this legal mess. He may succeed in proving himself innocent of the allegations levelled against him, and could very well make a clean political career. 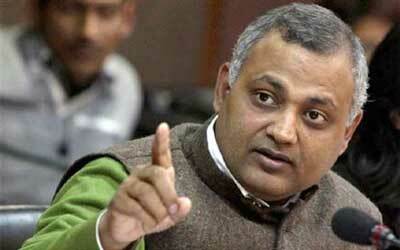 Ganesha wishes a great time ahead to Somnath Bharti.